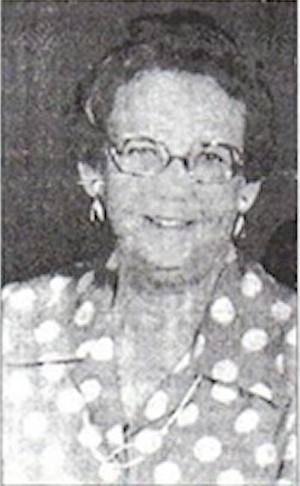 Obituary – Kemnitz, Katherine Viola (Lau) « Perry High School Alumni Association, Inc.
Katherine Viola (Katie) Kemnitz, 92, a long-time Perry community resident, died at 10:30 p.m. Friday, March 26, 1999, at Perry Green Valley Nursing Home. She was born Oct. 21, 1906, southwest of Perry, near Orlando, the daughter of Emil and Carrie (Garrett) Lau. She attended school at Harmony district 17 and graduated in 1925 from Perry High School. Mrs. Kemnitz and John A. Kemnitz were married Sept. 1, 1926, in Enid. She was a member of Christ Lutheran Church. Funeral will be at 2 p.m. Wednesday, March 31, at Christ Lutheran Church. Rev. Myron C. Maltz, pastor, will offfciate. Burial will be in Grace Hill Cemetery under the direction of Brown-Sissen Funeral Home. Memorial contributions may be made in her name to Christ Lutheran Church. Survivors include three sons and daughters-in-law: John and Darlene Kemnitz, Ponca City, Charles and Laura Kemnitz, Perry. and Edward and Anita Kemnitz, Colona, IL; seven grandchildren and their spouses: Craig and Ruby Kemnitz, Perry, Brent Kemnitz and Kelly White, Wichita, KS, Paula Cooper, Pied¬mont, John Kemnitz, Chicago, IL. Kathy and Kurt Gramling, Boynton Beach, FL, Karen Kemnitz, Iowa City, IA, and Mary Kemnitz, Colona, IL; two great grandchildren: Lauren Rau, Perry, and Katie Cooper, Piedmont; and four sisters and one brother-in-law, Eveline Jerome. Vancouver, WA, Ethel Kirk, and Jessie and Kenneth Carmack, Perry, Helen Beckham, Winfield, KS; and numerous nieces and nephews. She was preceded in death by her husband, parents, three brothers and two sisters.